We’d love your help. Let us know what’s wrong with this preview of Teen Boat! The Race for Boatlantis by Dave Roman. To ask other readers questions about Teen Boat! The Race for Boatlantis, please sign up. This is a very unusual book, even for a graphic novel. Teen Boat suffers from intense feelings of being a fish out of water as he walks the halls and classrooms of Dockside High. The reason is that he can transform into a small yacht, so he is literally a boat out of water. Many of the other students tease him for his differences, which is a bit odd, for being friends with Teen Boat could mean that you could spend a lot of time on him on the water. The story involves a boat race and a mysterious city called Boatlantis that is inhabited and controlled by sentient boats. Most of the standard teen angst situations are presented, Teen Boat yearns to be accepted and he feels that residing in Boatlantis will solve his problems. In a standard plot device, Teen Boat does make it to Boatlantis and he makes some discoveries there that make him realize that even this change of scenery will not solve problems that are internal to his concept of himself. There is the actions of a greedy robber baron that need to be countered and a revelation about the true nature of his best friend, but at the end Teen Boat discovers that the niche he was in wasn’t all that bad after all. While the scenario is most unusual, the fundamental story is the old one of a teenager facing feelings of uncertainty and aloneness. The conclusion is a positive one, the path there makes it an interesting and entertaining story. If you think being a teenager is hard, try being a teenager who is half human and half boat. That's right, Teen Boat, or TB, is half boat and can transform from a teenage boy into a yacht. As he puts it, "I've survived choppy waves, white squalls, and even a pirate hijacking! But none of those things compare to the tempest that is high school." He has always felt like an outsider due to his unique ability, but when he hears about the Orca's Cup boat race, he is sure this is the chance to make ev If you think being a teenager is hard, try being a teenager who is half human and half boat. That's right, Teen Boat, or TB, is half boat and can transform from a teenage boy into a yacht. As he puts it, "I've survived choppy waves, white squalls, and even a pirate hijacking! But none of those things compare to the tempest that is high school." He has always felt like an outsider due to his unique ability, but when he hears about the Orca's Cup boat race, he is sure this is the chance to make everyone notice him in a good way. Perhaps he can even win the heart of foreign exchange student, Nina Pinta Snata Maria, the girl of his dreams. Of course, things are never that simple in life (even in a graphic novel), so there are all sorts of complications - his best friend Joey joins another yacht's team, his principal is urging him to cheat, he's stuck with the bully of the school as his team captain for the race, and he finds out that the trophy cup could actually open a way to Boatlantis. Yes, the lost city of Boat civilization may be accessed by the winner of the Orca's Cup. Could this be the chance to save the day, win the fair maiden, and perhaps even learn about his own ancestry? A boat's gotta do what a boat's gotta do. For readers who enjoy comic stories, turning teen angst on its head, and silly word plays on nautical terms, this is a book to make you laugh out loud. In 'Teen Boat! The Race for Boatlantis' we learn that it's tough to be a teen. Especially one who can turn into a boat. This is the second book in the series, but if you haven't read the first one, you'll pick up on things pretty fast. Teen Boat (and that is the name he uses) is a strange boy who has the ability to jump in the water and become a yacht. No one seems to have a problem with this, but he feels like the odd man out. When a rival shows up in town, named Teen Bot, who is a robot teen th In 'Teen Boat! The Race for Boatlantis' we learn that it's tough to be a teen. Especially one who can turn into a boat. This is the second book in the series, but if you haven't read the first one, you'll pick up on things pretty fast. Teen Boat (and that is the name he uses) is a strange boy who has the ability to jump in the water and become a yacht. No one seems to have a problem with this, but he feels like the odd man out. When a rival shows up in town, named Teen Bot, who is a robot teen that can transform, Teen Boat jumps into a competition on the water. The prize could lead Teen Boat to the fabled city of Boatlantis (among other surprises). There are bad guys, wacky pirates, misunderstood friendships, and load of groaner puns. The only thing missing was the teenage acne. I loved the art by John Green and the story by Dave Roman. It's ludicrously over the top, funny and touching all at the same time. If it sounds too silly for you, then you might be right. What really sells it to me is the bright art and the upbeat story. It was just fun all around. 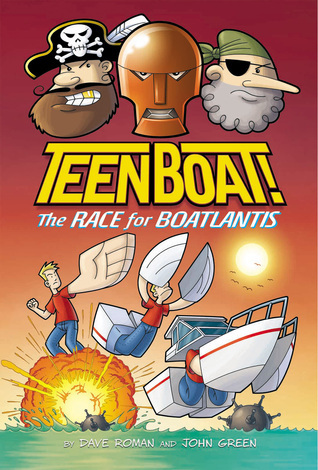 TeenBoat - the teen with the power to transform into a boat when wet - takes part in a competition with the hope of finding the fabled city of Boatlantis. But being a boat and a teen isn't as glamorous as you might think - especially when a new kid at school threatens TeenBoat's claim to fame as the only boatkid on the block. This graphic novel really does have all the ANGST of being a teen, coupled with I received a digital copy of this title from the publisher via Netgalley. This graphic novel really does have all the ANGST of being a teen, coupled with the THRILL of being a boat! Essentially, this one is as hilariously silly as it sounds and perfect for those times when you just need a brain break in a land that always features an unlikely inlet, canal or fjord. This is Saturday morning cartoons in book form. There’s a great twist when Teen Boat discovers what his rival can transform into and Teen Boat’s principal has a good bash at trying to relive his youth while posing as an unconvincing student in order to help find Boatlantis and a long-lost love. TeenBoat is a balm for the jaded soul…or just easy, mindless fun for the slightly bored. A truly bizarre premise of a teenager who can transform into a boat. We meet his friends and find that as a result of being a boat he is taunted at school. He is given an opportunity to participate in a race with a grand prize. And can't really say more without spoilers. All in all even with the completely bizarre plot it may really appeal to middle schoolers. The art isn't bad it has neat little chapter headings and while it very much simplifies things and glosses over the complexities of the issues it tries to address I feel an honest attempt is being made to make some tough issues: single parent homes, bullying, and dating accessible to kids. TEEN BOAT! THE RACE FOR BOATLANTIS is the sequel to the TEEN BOAT! graphic novel about an angst-ridden teen who has the ability to change into a boat. As part human, part boat, he struggles with his identity and finding a place in the world, all while navigating through the storm that is high school. Filled with silly boat puns and references to 80s movies and the 90s TV series DAWSON'S CREEK, THE RACE FOR BOATLANTIS has TB caught between choosing the world of humans or the world of boats (Boatla TEEN BOAT! THE RACE FOR BOATLANTIS is the sequel to the TEEN BOAT! graphic novel about an angst-ridden teen who has the ability to change into a boat. As part human, part boat, he struggles with his identity and finding a place in the world, all while navigating through the storm that is high school. This one moves away from the high school premise and focuses much more on the 'boat' than the 'teen' aspect. It's actually sort of neat how there's a duality when you read both books together, one mostly teen and the other mostly boat. As a result it wasn't quite as funny as the first one, but there was a lot more plot. A very satisfying conclusion to the series. The title pages for each chapter never failed to get a big smile from me. I won this ARC in a goodreads drawing. An angst ridden teen can turn into a boat. He's got the usual cast of friends, only in this case, his love interest can turn into an iceberg. He's got to win a race against a rich kid who can turn into a yacht chair, to get into Boatopia. Pretty good stuff. I would prefer color, instead of black and white, though. Prepare for old timey words! This book was a hoot to read! Think Knight Rider if Michael Knight actually turned into KITT and was 17 years old. It was an advance copy, so the book was in B&W, but it did not detract at all. To Misters Roman and Green I say "Thank You"! A quirky and well written story that my daughter and I both loved. "The ANGST of being a teen with all the THRILL of being a boat!"... what's not to love? And yes, it really is about a boy who can turn into a boat. This review has been hidden because it contains spoilers. To view it, click here. I won this in a First Reads Giveaway and gave to my eight-year-old son to read. He absolutely loved it, he said the story was action-packed and loved that Teen Boat turned into an actual boat, he thought that was cool and unique. I read an ARC of this graphic novel. This is the second story about a boy who can turn into a boat, which is definitely unique, but I think what make these books successful is that the authors know their audience--which is demonstrated through the humorous dialogue and wordplay. I didn't think it was possible to top the first instalment of Teenboat, but it has been done. Teenboat 2 changed my life. it was one of the most spectacular stories I have ever know. A boy who can turn into a boat - the premise is original, the dialog and feel of high school is spot on, the puns are awful and Teen Boat Rocks. Pretty clever at times. Funny most of the time. Artwork is great all of the time. Really trippy series about a boy who can turn into a boat ! great fun for younger teens, looking for action and aventure. These books just crack me up. Such a silly concept, but so much fun! I loved this book because of all the witty word play and puns--and the shot of Lunch Lady at the school. Teen Boat is just pure fun. Unabashedly silly-and so much fun. Teen Boat---a teenager that turns into a boat! Imagine the trauma such a physical trait could add to your high school years. Or, just read this book and live it vicariously, along with assorted other really strange things in a high school setting. Your prom was never this awkward, I'll venture. The good: The illustrations are detailed and engaging, and you can actually tell that you're looking at a boy transforming into a boat. The drawings are brightly colored. The columns of drawings are the ri Teen Boat---a teenager that turns into a boat! Imagine the trauma such a physical trait could add to your high school years. Or, just read this book and live it vicariously, along with assorted other really strange things in a high school setting. Your prom was never this awkward, I'll venture. The good: The illustrations are detailed and engaging, and you can actually tell that you're looking at a boy transforming into a boat. The drawings are brightly colored. The columns of drawings are the right size, the font is spot-on, the sound effects and actiony words are appropriate. Basically, it's a fine piece of graphical work. I received this book as part of the Goodreads First Reads program for the purpose of a fair review. Overview: Teen Boat has finally hit the big time. He has a chance to become popular by winning The Orca Cup. It should be a cinch, because he’s…well, a boat. Likes: This one is aimed at the teenagers in your life. Teen Boat’s mom shows to be proud of him. Dislikes: I got a black and white copy for the book, so I’m not sure how the book was really supposed to look like. Also, I didn’t get much of the I received this book as part of the Goodreads First Reads program for the purpose of a fair review. Dislikes: I got a black and white copy for the book, so I’m not sure how the book was really supposed to look like. Also, I didn’t get much of the humor. Conclusion: This one might be okay for those who enjoy the comic books, and some teenagers. Meh. The art was fun, but the writing was soooooo lame. The constant use of puns was just such a huge turn off, setting aside the weird premise of a boy who can turn into a boat. From a professional perspective, I just couldn't decide where to place it gradewise. It's set in a high school, but I felt like the dialogue was even too groan-inducing for middle schoolers. These books are ridiculous to the point of amazing. Like nautical puns? Sarcasm? Pop culture references that somehow defy the odds and don't go out of style? Not to mention witty writing and stellar drawing? This is the book for you. My copy came in today and I had to read it right away for myself...but also because my students are clamoring for it! I won this book in a giveaway.... I really did try to read this one but just couldn't get in to it. I'm sure one of my grandsons will like it. Guess it's just not my kind of book.